On May 21st, I purchased a pair of new Robeez (shown right) for my 14-month-old son who took his first steps on May 15th. They are perfect for summer; lightweight canvas and light colored, so won't be too hot on the hottest days. (This design is SO cute, too!) Last week - 3 weeks after I bought them - I noticed that the seam holding the white trim at the bottom was coming apart. I made sure that Brandon didn't wear these shoes anymore after I noticed it so that I could return them to Boomerang Kids where I bought the shoes. I tried to get the shoes exchanged on June 17th at Boomerang and they refused to take the shoes back as they said they were too worn. It was suggested that I contact Robeez directly to see what could be done. I had already emailed Robeez due to the obvious quality control issue to let them know what was happening with their shoes. In their response to me, they indicated that if the retailer would not take the shoes back to let them know. I proceeded to take detailed pictures of the shoes to send to them so they could see the condition they were in. I posted the pictures on the Web, in my public photo album, so that they didn't have to download them as attachments in an email. Your Return Authorization Number is XXXX. Please be sure to write this number on the package you are returning. Make sure to email us a copy of the below form before you mail us your shoes. This will insure both the warehouse, and customer service have your information, and replacement options. We do suggest that you send them some way traceable, as we are not responsible for the shoes until they arrive. Please fill out the form below and return it along with the shoes. Robeez reserves the right to inspect all footwear, and to determine in its discretion whether replacement is appropriate. If replacement is appropriate, we will attempt to replace your shoes with the identical style. For those items which are seasonal or otherwise unavailable and cannot be replaced with an identical style, we will provide a comparable replacement. If you wish to designate a comparable style, please list the stock numbers of three (3) comparable styles of your choice. If you do not list any style numbers or if the listed styles are not comparable or are unavailable, we will select a suitable substitute. Please note that ALL REPLACEMENTS ARE FINAL AND ARE NOT EXCHANGEABLE. Make sure to mail your shoes in a way you can keep track of them. We cannot be held responsible for the shoes until we receive them. IF NO MANUFACTURING DEFECT IS FOUND, THE SHOES WILL NOT BE RETURNED TO YOU. They want me to ship the shoes to them (at my expense) for the POSSIBILITY of a replacement pair if they determine it is appropriate after they "examine" the shoes for defects. If the shoes get lost in transport, I'm out of luck because it's not their problem. That means traceable shipping and insurance (depending on the courier), all adding up to increased costs for the shipping for a pair of $30 baby shoes. Robeez is a premium brand of baby products; the expectation with premium brands is that you also receive premium customer service. In this situation, it would have been appropriate for them to ship me a replacement pair with a shipping label (pre-paid) for the old shoes to be returned to them. Or, if absolutely necessary to examine the shoes first, then send me a shipping label and then I'll ship them. As a consumer who purchased a product in good faith that it would last and be good quality, the onus should be on the manufacturer to restore good faith by providing me with a replacement product without requiring me to incur further expense. I drafted a reply to the customer relations representative and just as I was about to send it, I checked my Twitter account. I had just received a reply from @striderite to a post I made the previous evening about this situation. At this point in time, I was pretty frustrated and expressed my frustration to the rep on Twitter. I didn't get an immediate response, so I went ahead and sent my reply back to the customer relations representative. 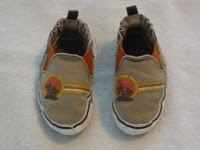 In it, I indicated that I wasn't interested in sending the shoes back at my expense and that I would fix them myself. I did also mention that I'm a vocal consumer and that I comment about these types of things through Twitter, Facebook, on my blog and to friends directly. This was not said as a threat, but as a statement of fact. That is the world we live in today and companies have a greater need to maintain goodwill with customers since information is so readily available via the Internet. As I see it, companies that work to maintain goodwill benefit from positive and free marketing by people like me. On the other hand, those companies that let consumers down repeatedly will be exposed - again, by people like me. It's about accountability and community goodwill with consumers and potential customers. The next morning, June 19th, I got replies from the rep via email with a promise that they would send a shipping tag for me to use to send the shoes back. I also had tweets from @striderite indicating that they understood my concerns and had contacted customer service on my behalf and I should be hearing from them. I sent back the information they needed and I'm just waiting on them to take the next steps on their end. The situation is looking up and I expect that it will work out in such a way that I'll continue to be a Robeez customer in future. Though I wasn't initially impressed with the process, they have responded to my concerns in an appropriate and timely manner and that type of positive response absolutely deserves to be acknowledged. While the story isn't over yet, I am now more hopeful of a positive outcome...both for me and for Robeez/Stride Rite's future customer service policies.